Paul’s Tomb trail is one of the popular trails of Knox Mountain. It begins at the Knox upper parking lot and descends gently along the slope of Okanagan Lake. This is a good walk for the whole family and is a relatively easy route to cycle as well. At the end, of course, is an old tomb but there are also some beaches, interesting caves and rock formations to explore. Ok, but who is Paul? Fun fact: Paul is actually a surname. The tomb contains Rembler and Elizabeth Paul. There is also a full-sized locked metal door beneath the stone arch visible today. The door was covered with a load of dirt 50 years ago after the tomb was vandalized. To continue the history lesson, go here. Another interesting fact useless to hiking Paul’s Tomb trail is that Ogopogo is not too far from the shore at the end of the hike. 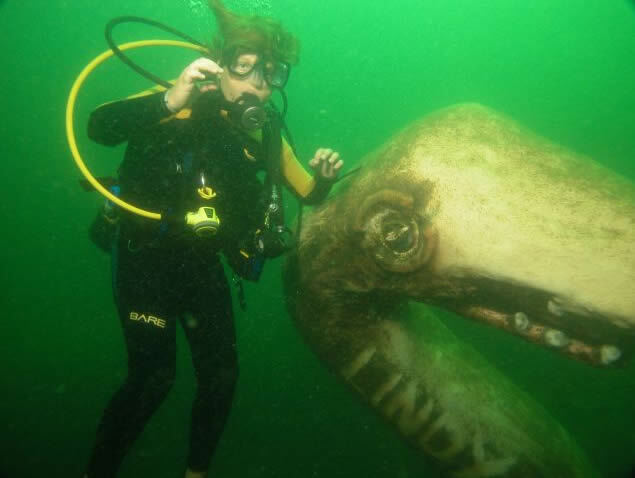 Not known well outside the local diving community, it rests about 30feet underwater – check out this pic. After Paul’s Tomb, you can continue on to Lochview trail but this is a one-way trip. The main trailhead to Paul’s Tomb begins at the upper parking lot (Lower Crown Lookout) of Knox Mountain which is normally accessible unless the gate is shut at the bottom of the mountain. If this is the case, you can still hike up 1/3 of the Apex Trail to the parking lot and Paul’s Tomb trailhead. Alternatively, there is an access point off Poplar Point Dr (turn left at the north end of Ellis Dr instead of entering the main Knox parking lot). This cuts off half the hike including steep downhill sections and is preferable for families with small children.